I am writing this introductory note from London during a layover on my way to Rome, and I’ll append a personal ending tonight after I finally make my way back from dinner to the hotel. One of the few consensus ideas that I took away from the Strategic Investment Conference is that China has the potential to become a real problem. It seemed to me that almost everyone who addressed the topic was either seriously alarmed at the extent of China’s troubles or merely very worried. Perhaps it was the particular group of speakers we had, but no one was sanguine. If you recall, a few weeks back I introduced my young colleague and protégé Worth Wray to you; and his inaugural Thoughts from the Frontline focused on China, a topic on which he is well-versed, having lived and studied there. Our conversations often center on China and emerging markets (and we tend to talk and write to each other a lot). While I’m on the road, Worth is once again visiting China in this week’s letter, summing up our research and contributing his own unique style and passion. I think regular TFTF readers are going to enjoy Worth’s occasional missives and will want to see more of them over time. Now, let’s turn it over to my able young Cajun friend. In my Thoughts from the Frontline debut this past March (“China’s Minsky Moment?”), I highlighted the massive bubble in Chinese private-sector debt and explored the near-term prospects for either (1) a reform-induced slowdown or (2) a crisis-induced recession. Unfortunately, it was not an easy or straightforward analysis, considering the glaring inconsistencies between “official” state-compiled data and more concrete measures of real economic activity. Although John and I spend hours every week searching for the truth in a murky stream of official and unofficial reports, we always reach the same conclusion about the People’s Republic: There is really no way to know what is happening in China today, much less what will happen tomorrow, based on widely available data. The primary data is flawed at best and manipulated at worst. Sometimes the most revealing insights lie in the disagreement between the official and unofficial reports… suggesting that official data is useful only to the extent that we think about it as state-sanctioned propaganda. In other words, it tells us what Chinese policymakers want the world to believe. This shortfall in credible and actionable data from one of the global economy’s largest and most interconnected members leaves us with more questions than answers – especially in the presence of a massive Chinese credit bubble, with clear signs of overinvestment and unsustainably high debt-service ratios. These are troubling signs for all investors, in every asset class, everywhere in the world today… and everyone should be paying close attention. Although China is the world’s largest producer of value-added manufactured goods, it has not been an export-led economy for a very long time. 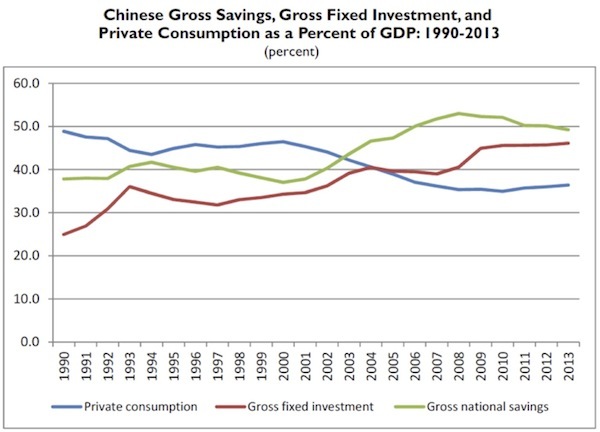 As I detailed in last month’s letter, China’s growth has largely relied on extraordinarily high levels of fixed investment, supported by even higher levels of domestic savings and an unsustainable rise in private-sector credit. Even so, industry experts often fall into the trap of extrapolating flash manufacturing readings into forecasts for the broader economy. On a side note, I don’t mean to disparage the China research team at HSBC or question their competency by reprinting the comments above. I’m sure they get up each morning (just like I do) with a genuine intent to understand changing economic conditions as best they can and to help their clients protect and grow their savings. If anything, this example is a broader indictment of investors’ widespread reliance on a handful of flawed or misunderstood data points in the absence of credible Chinese economic data. I don’t mean to be cute or coy on this issue. The lack of transparency of the Chinese economy is not just a problem for individual and institutional investors who make the choice every day to put their money at risk; it also carries enormous policy implications for central bankers and elected politicians in a highly unstable global system where total debt-to-GDP has risen across the world’s major economies by nearly 35% since 2008… and continues to rise. 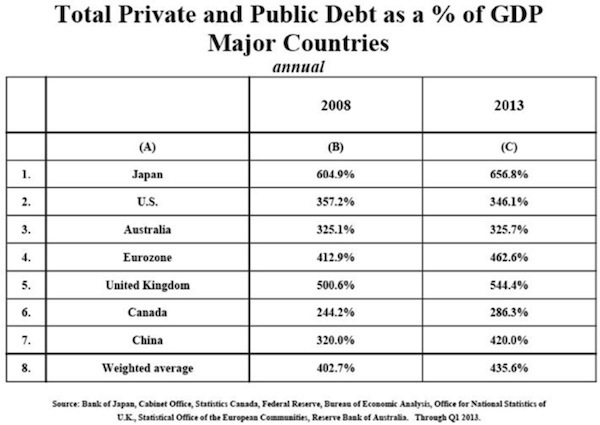 As you can see in the table above (which Dr. Lacy Hunt was kind enough to share with us at this year’s Strategic Investment Conference), China has seen its total debt-to-income ratio jump by more than 100% (another full turn of GDP) in the last five years… more debt growth than any other major economy on the planet, including Japan. To continue reading this article from Thoughts from the Frontline – a free weekly publication by John Mauldin, renowned financial expert, best-selling author, and Chairman of Mauldin Economics – please click here. The article Thoughts from the Frontline: Looking at the Middle Kingdom with Fresh Eyes was originally published at mauldineconomics.com.